Well it is spring after all. And whats spring without florals... lots of florals! 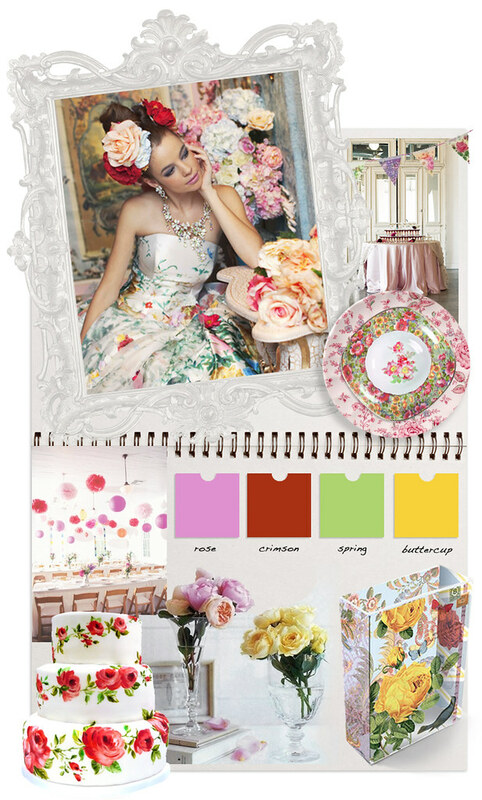 This month is in full bloom with chintzy roses and plenty of pretty colours - buttercup, crimson, spring and rose. Beautiful floral wedding dress by Stella de Libero. Chintz bunting and vintage plates. Champagne glasses stacked on a pretty pink table via Utterly Engaged, photo by Bonnie Tsang. Colourful paper lanterns and pompoms decorate the ceiling, via Style me Pretty, photo by The Nichols. A wedding cake decorated with hand painted roses, by Amelie's House. Simple vases of flowers via Oh So Beautiful Paper. Paisley Rose vase from Fringe Studio.